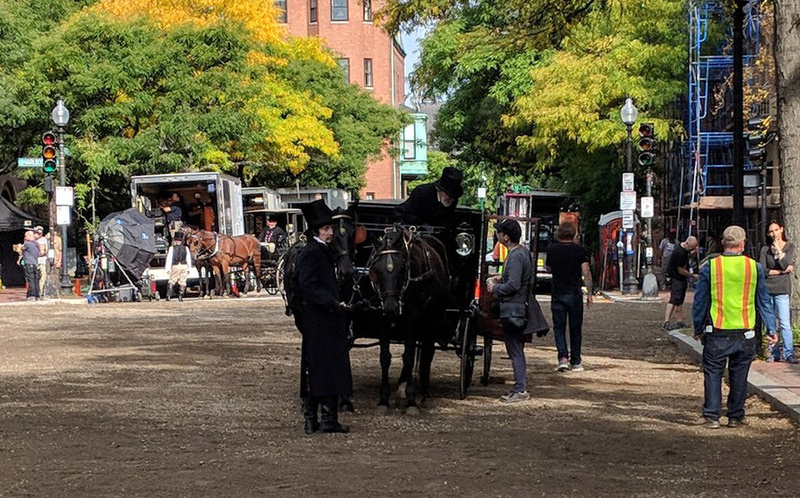 Greta Gerwig is filming part of her version of "Little Women" on Dartmouth Street in the Back Bay, and that means covering the asphalt with dirt to recreate 19th-century scenes featuring horses and carriages, as Pilotblock observed this morning. Ever heard of camera angles? We got a notice about the road closure the other day. Also said they would remove signs, signals etc. as necessary (or BTD would). Looks like all is back to normal now. There's a lot that gets done with CG in making period pieces look more authentic. They do what they can with practical effects so it doesn't look totally artificial, but if some modern signage shows in frame it's easy enough to remove that. Do we really need yet ANOTHER remake of "Little Women"? Lady Bird and Frances Ha are great. Hopefully her talents aren't wasted on this. Yeah, but in this one they're bank robbers from Charlestown! It's a nice day out and I have better things to do than to answer a comment whose poster has some anger issues involving elected officials. Let me just say that if you don't know who Greta Gerwig is, I can give you some helpful tips on how to look her up online. looks expensive and..like why chose that spot? Although the Alcotts are associated with Concord, they spent a fair amount of time living in Boston - mostly Beacon Hill, but Louisa May once thought of committing suicide in the Back Bay. The Gibson House Museum . . .
at 137 Beacon has wonderful historic interiors and is serving as the NYC boarding house where Jo goes to work as a governess. If you've never seen the museum, it's worth a visit. Tours are on the hour at 1, 2, and 3 pm from Wednesday through Sunday. Well worth a visit - life as it was late 19th and early 20th century. Wild guess why they chose that spot- there is a really cool looking mansion (if that's the right word?) Just to the right of that carriage. Looks perfect for a period setting. Film sets can be annoying when they take over a block. But that said, it's cool to watch a movie and recognize your block, or an area you pass by regularly in a scene. I assume either the film company or the city will clean up after themselves. And if it's the city, I'm sure the film company is paying well for the services (including Sunday OT). They come in when the permit clears the street and dress the location as needed. Other departments do their biz. Then they shoot and afterwards the location is reverted back to its original condition. Location teams and production companies don't mess around with this stuff. It's all done by the numbers spelled out in the permitting and they company makes it right if need be. Otherwise they'll burn their ability to shoot wherever they're filming. When filming was done, a crew cleaned up the street. I think this is quite interesting! Glad Boston can serve as a backdrop for a film about well-regarded authors. Thanks for posting! I was just visiting my dad in Savannah, and a section of downtown had the same treatment for shooting "The Lady and the Tramp". We really felt sorry for the people in period dress having to walk around in 90*+ heat. Wouldn't it be cheaper to shoot in Georgia or Vancouver, where most all other movies are filmed? We give tax credits to film makers. Plus, we've got Authenticity (tm).